During the Classic period (A.D. 250-900), the Maya erected large stelae in ceremonial courtyards as public testimony to their divine authority. Often hieroglyphic text traced the ruler's royal lineage and commemorated important events such as birth, accession to power, or success in battle. This late Classic carving differs from its predecessors in that it lacks any text and it was not freestanding. One of the relatively rare round architectural columns from the Puuc region in northern Maya lowlands, it dates from the transition period of Maya history when royal authority shifted from divine to secular sponsorship, military in nature. 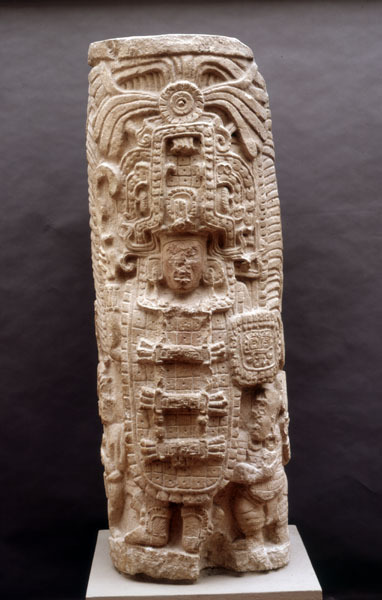 Here the ruler, dressed in the ceremonial garb of a warrior, carries a curved weapon in one hand; in the other is a shield decorated with the stylized face of the central Mexican rain god Tlaloc. The ruler's headdress is formed by the open jaws of the earth monster and is adorned with an abundance of feathers. Status is indicated by an enormous vest of jade squares and the high-backed sandals of the elite. More often presented alone, this ruler is accompanied by two dwarfs.